Should I be contributing to a cruising guide to Antarctica? Skip Novak: Should I be contributing to a cruising guide to Antarctica? Does the plan for a cruising guide to Antarctica represent another ‘paradise lost’, another remote area tidied and packaged? There is a plan afoot for a cruising guide to Antarctica. I know this as I was asked to contribute to it. At risk of alienating a large part of the cruising sailors around the world, and not a few publishers, I would like to throw this curve ball out there. Although we all use cruising guides once they appear – it would be silly and irresponsible not to – I cannot help being amazed at their proliferation for all points on the globe, however remote. They have their place, of course, in well travelled areas to facilitate cruisers who have no time to do the research on the ground – fair enough. What’s done is done. What will happen though, and we are not far off it now, is that there will be nowhere else to discover on our own (even if it is an illusion, as it is rare now to be the first anywhere). Twenty-six years ago I ‘discovered’ the far south, where no cruising guide existed. It was exactly what I was looking for – if ‘exploration’ was an exaggeration, then ‘cruising frontier’ was a fairly accurate description. The joy, and often the struggle and sometimes downright pain in finding our way through the fjords of Chile and the archipelago of the Antarctic Peninsula was experimental, to put it mildly. Uncertainty was a given. We ran aground often, wound up in untenable anchorages and survived various dramas, and in doing so also made ‘discoveries’ that we revelled in. To record our wanderings we sketched ‘mud maps’ and kept them (still do) in a book we called our ‘Rutter’. Of course, we were not the only ones roaming around. Many pleasant evenings were spent rafted up with other likeminded voyagers, where we freely traded the sketches and local knowledge – in the beginning with tracing paper and pencil, glass of whisky in hand. It was a guidebook of sorts, but not one you buy off the shelf, rather one purchased with time. This tradition of information exchange continues on web forums and, although less personal, is at least a point by point approach rather than a compendium. It should be selective. After hastily introducing himself on the dock in Ushuaia, one visiting boatowner asked if he could photocopy my entire Rutter. Not liking the cut of his jib, I politely declined the request. Then, in the early 1990s a Chilean ex-admiral had a go at a cruising guide which was of no consequence. In 1991 Jerome and Sally Poncet published Southern Ocean Cruising, which was mainly about aspects of environmental awareness on the Antarctic Peninsula. Back in Chile during 1998 the Royal Cruising Club published a cruising guide which was a simple overview and non-comprehensive. And shortly afterwards the magisterial Patagonia – Tierra Del Fuego was published by an Italian couple after ten years of cruising and documenting. The motives for writing cruising guides can be several. Marking territory? Financial gain? Opening up new cruising grounds for all those who will follow, resulting in another ‘paradise lost’? Well, it will be pointed out that I am guilty in all of the above. The difference is I wrote about what we did, but not necessarily where to go. That I left up to those who made the effort to discover it all for themselves. Skip Novak is a columnist and regular contributor to Yachting World, and author of our acclaimed Storm Sailing Series, which you can also find on our website. He was born in Chicago in 1952 and started sailing at an early age. He has raced in four Whitbread Round the World races and in 2001 co-skippered the 108ft catamaran Innovation in The Race round the world in 65 days, an event in which his future wife, Elena, also raced. 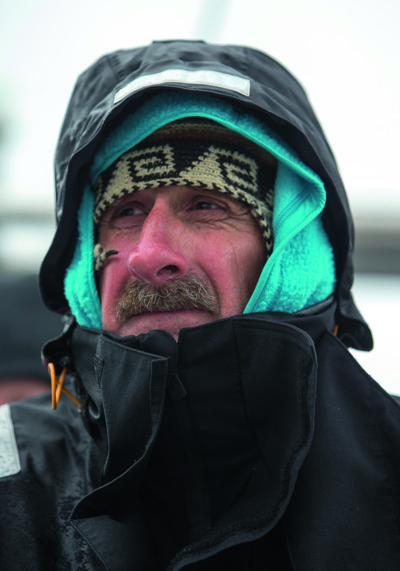 In 1987 he built the steel cutter Pelagic and has since spent 26 seasons in Tierra del Fuego, South Georgia and Antarctica, sailing and mountaineering.